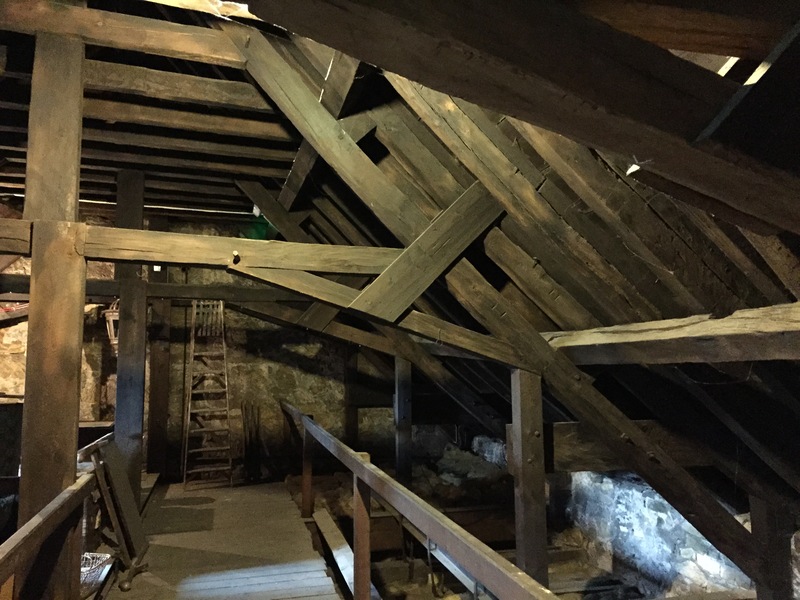 A big project is under way to date some of the surviving original timbers throughout Falkland Palace. 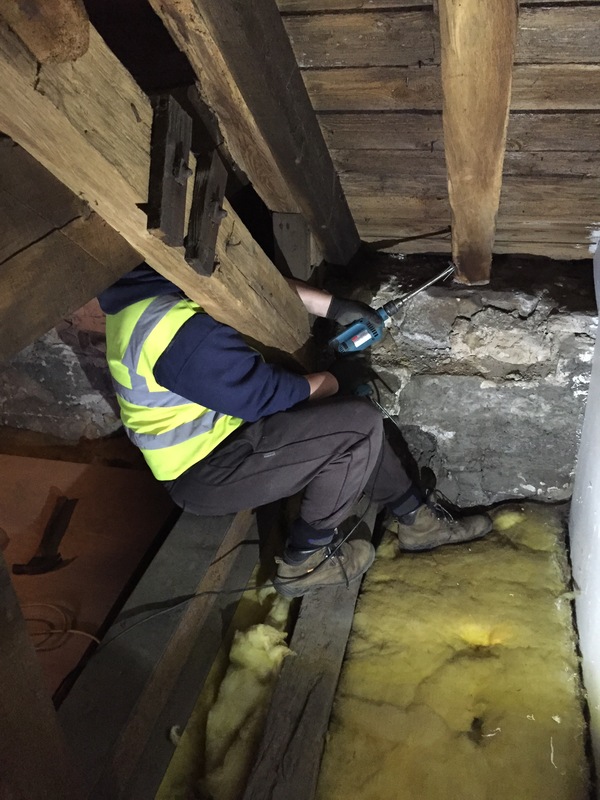 Anne Crone of AOC Archaeology Group and her colleague, Alan Duffy have been working their way through the buildings taking samples of the roof over the South Range, the roof of the Stables and the doors into the Chapel. Photo 1- Alan sampling in the South Range roof using a corer powered by an electric drill. The timbers in the roof spaces were sampled by coring, powered by an electric drill (Photo 1). In the South Range roof this sometimes involved getting into very uncomfortable positions (Photo 1), while in the Stables we had to use a scissor lift to get up in amongst the timbers (Photo 2) and that was even more uncomfortable! 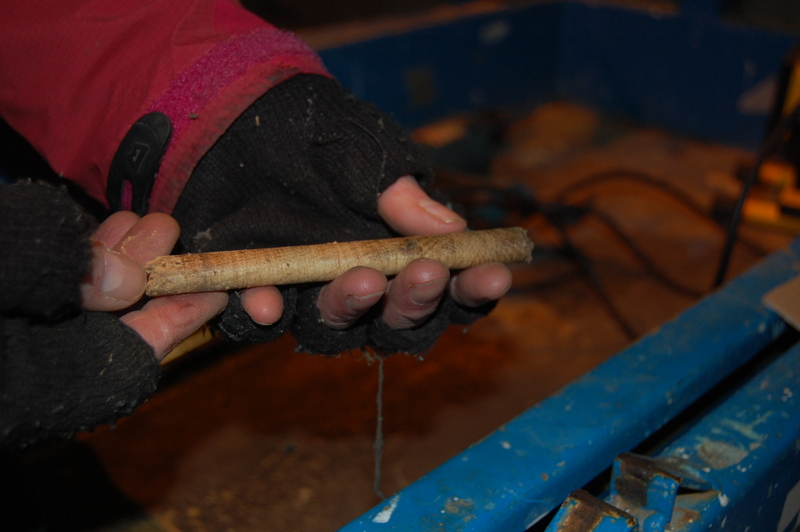 The corer removes a core of wood 10 mm in diameter (Photos 3 & 4); back in the laboratory the core has been glued to a wooden mount and the surface prepared so that the ring-pattern is clear. The sample is now ready for measurement and analysis. Photo 2- Working from the scissor lift in the Stables. 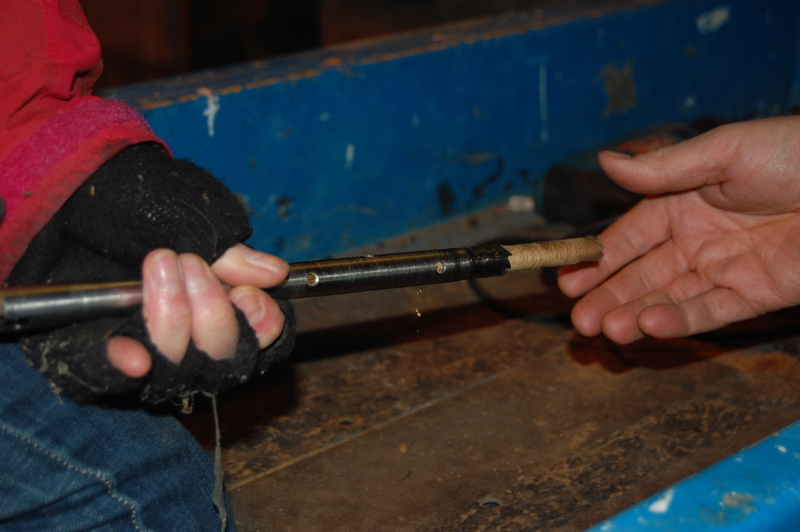 Photo 3- Removing a wooden core from the corer. Photo 4- The wooden core. The growth-rings are just visible at the right hand end of the core. 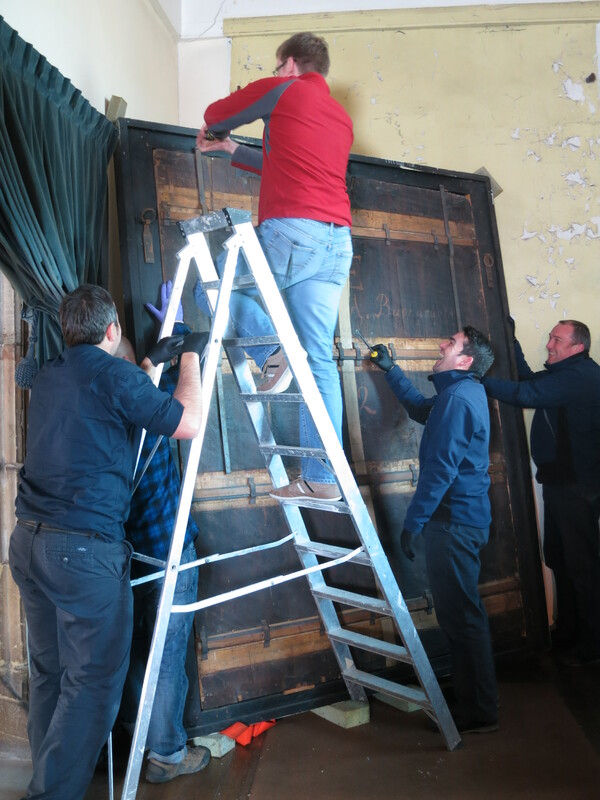 A different approach to sampling the doors of the Chapel has been taken because we cannot drill holes through them. The doors have all been made with vertical oak boards and the end-grains are visible on the tops of the doors. The surface of each board is prepared by finely sanding and cleaning it (Photo 6) and then a cast of the ring-pattern is made using Fimo clay (Photo 7). The Fimo clay is baked hard and so a reverse copy of the ring-pattern can be used for measurement. 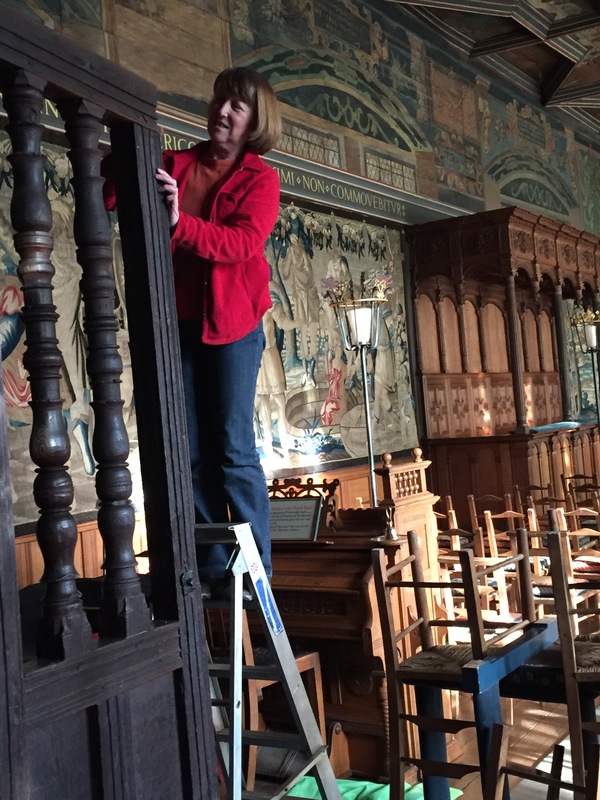 Photo 6- Anne at work in the Chapel at Falkland Palace, preparing the wood so that a cast of the ring-pattern can be taken. 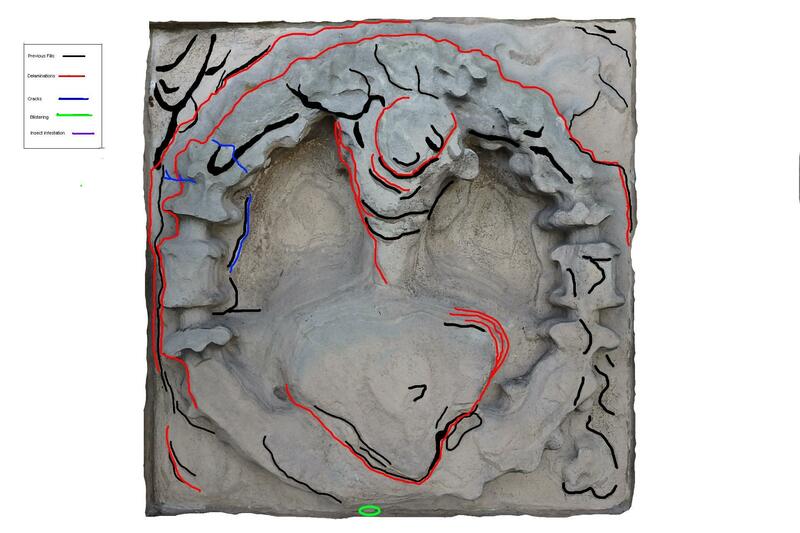 Photo 7- The cast is made using Fimo, a modelling clay – here the black Fimo cast can be seen in situ over the prepared surface of the vertical board. Photo 9- 9 Using the measuring equipment at AOC’s dendrochronology laboratory. 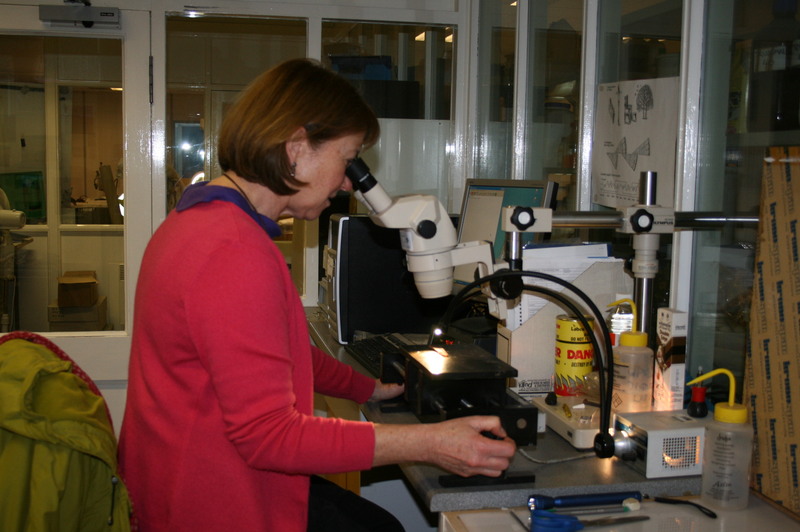 In the next few months Anne will be measuring and analysing the samples in the dendrochronology lab at AOC’s offices in Loanhead (Photo 9). 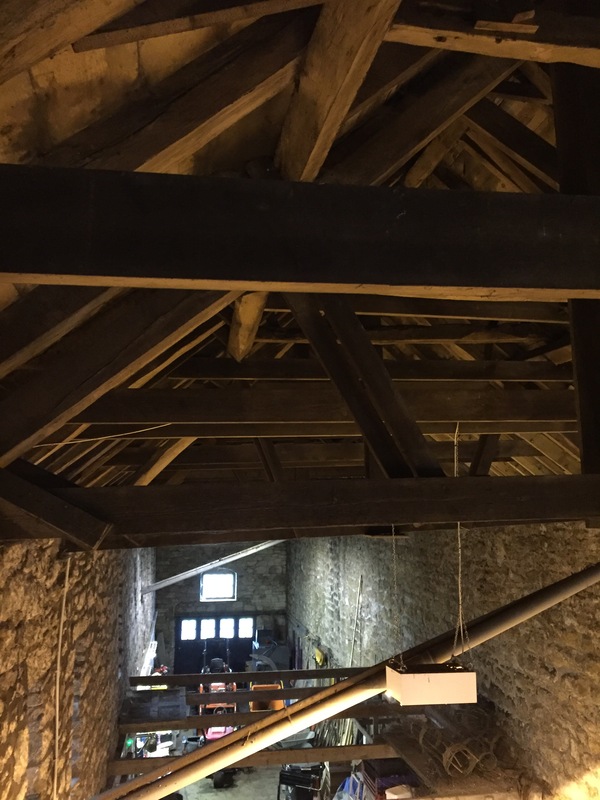 We are very excited to find out what when the original beams can be dated to. Keep an eye on the blog and Facebook page for updates on the results! Stables, view from the roof. 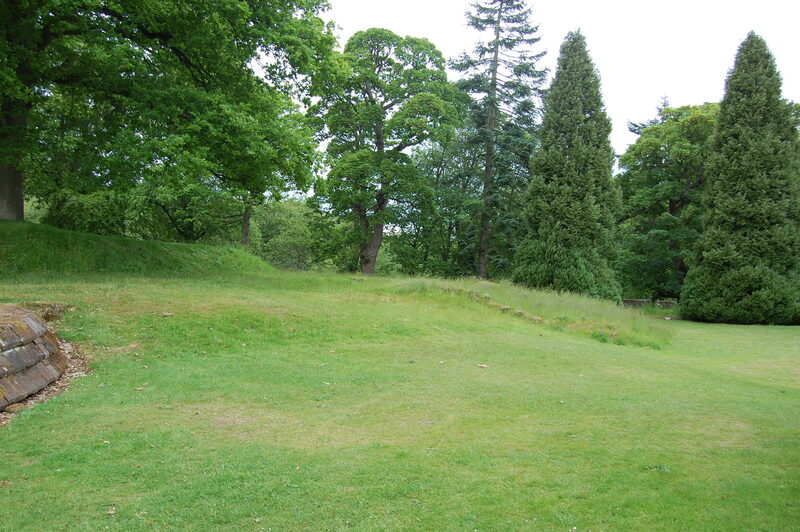 This entry was posted in Falkland Palace and tagged Archaeology, conservation project, falkland palace, falkland palace and gardens, National Trust for Scotland on March 17, 2016 by falklandpalacegarden. One of the roundels being prepared, ready for conservation. building work, completed in 1541. 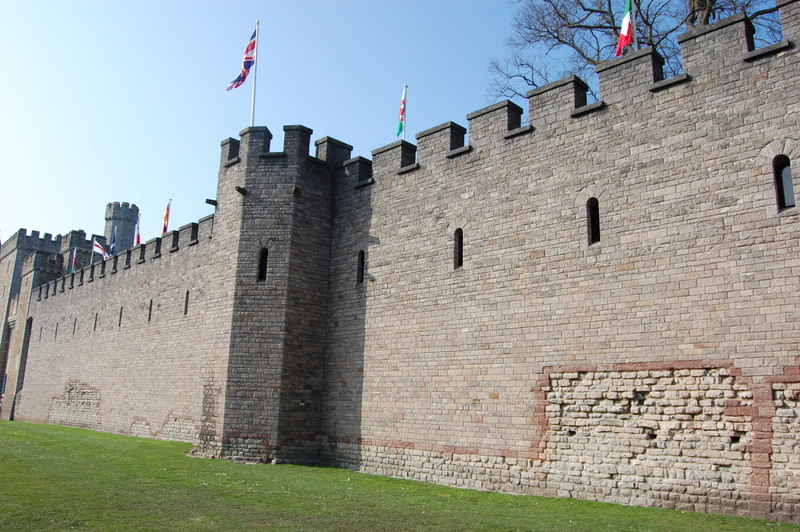 James had spent time at the French court (as well as having two French wives) and he employed French masons to work on the palace. He was hoping to recreate some of the splendor of the French court here in Scotland, and he employed the French master masons Moses Martin and Nicolas Roy to create the glorious roundels you see at the palace today. The roundels are also significant as it is rare to have five carvings and portraits of females. Although the roundels of the South Range are currently hidden behind scaffolding whilst they undergo conservation, you can still see their companions on the ruined East Range. The palace at the end of last year before the scaffolding was erected and work began. All the roundels are made of sandstone and appear to have been build face-bedded into the building (rather than naturally-bedded). 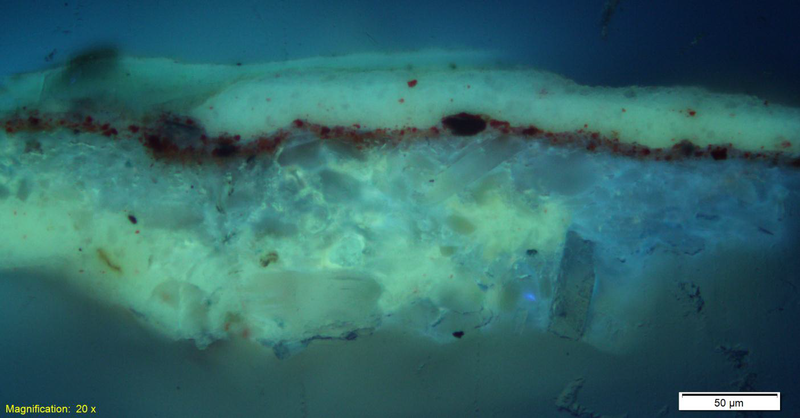 This means that the surface layers of the stone have deteriorated over time, in a process similar to the peeling of layers from an onion. Unfortunately, the surfaces of four of the heads have already been completely lost. However, the aim of the current conservation (part of our Year of Conservation at the palace) is to consolidate the roundels and prevent further loss and deterioration. Roundel before conservation showing signs of decay through age and acid rain damage. 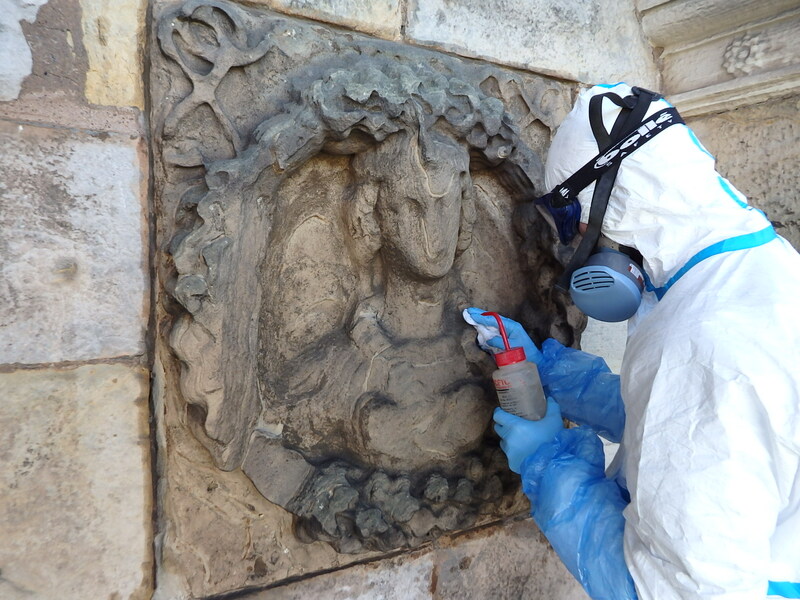 The first phase of conservation of the carved stone roundels on the South Range was from 7th-10th April. On the first day, the condition of the roundels was recorded and over the next few days some previous filler was removed. 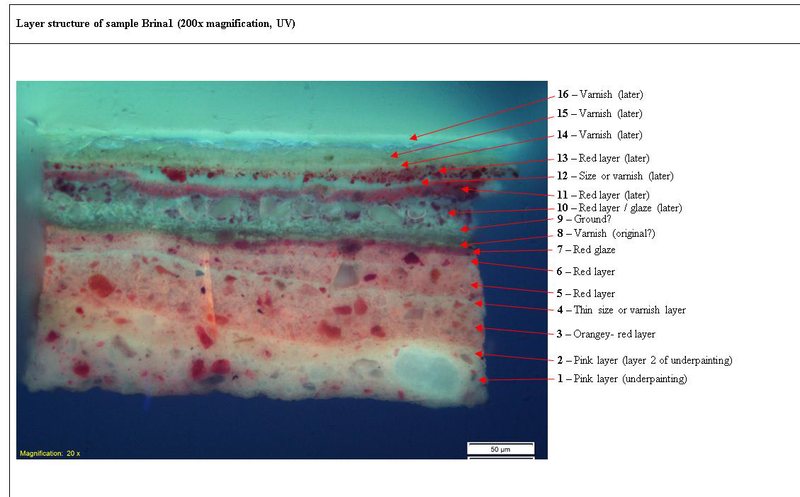 Below are some examples of the recording techniques used to document the stone (all the pictures were taken on the first day before any work began). Conservators record of the Margaret Tudor roundel. 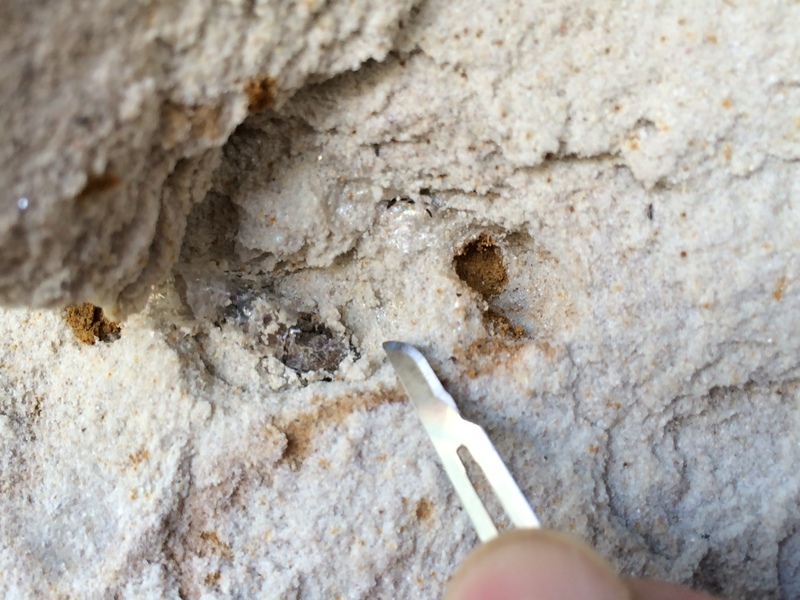 30 times magnified image of an insect infestation in the sandstone of one of the roundels. 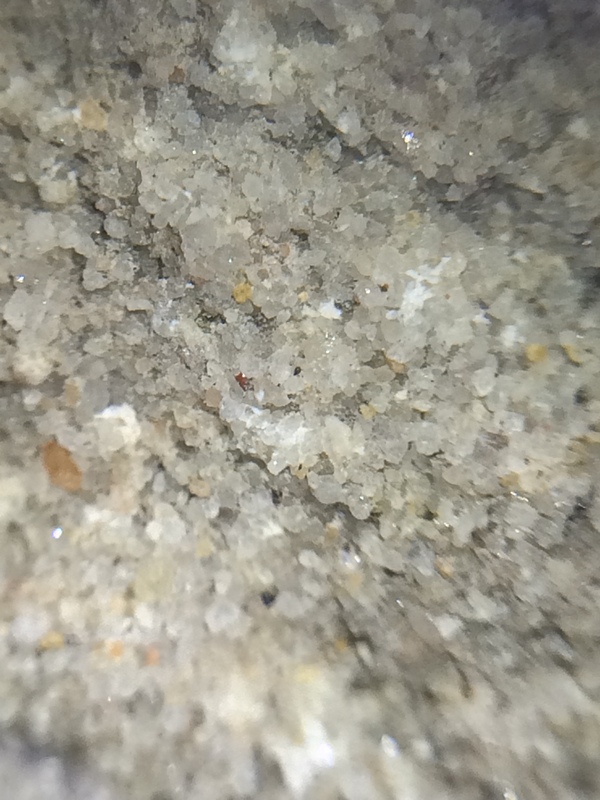 30 times magnified photograph of the actual surface of the sandstone. The roundels were then sprayed with Ethyl Silicate, a substance which helps to strengthen the stone. 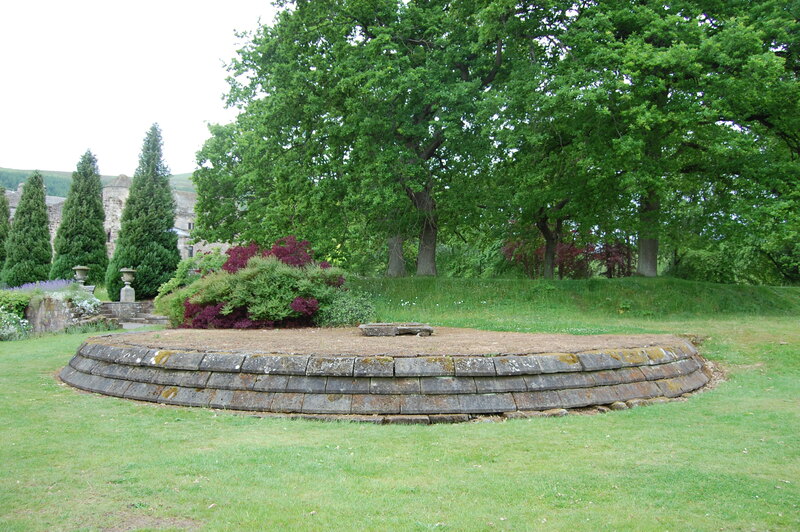 From 13th-29th April the roundels were then completely covered in order to protect them from the rain and sunshine. This gave the Ethyl Silicate time to set. Application of the Ethyl Silicate. Today, 30th April, the roundels have been uncovered. The stones are now much stronger and the next stage, lasting until 15th May, can begin. Old filler, which has weathered, will be removed and a lime-based grout will be used to fill in air pockets and voids. For the outer wreath shaped decoration, where stone has already been lost, T-shaped ceramic supports will be added, as well as thin stainless steal rods where necessary. 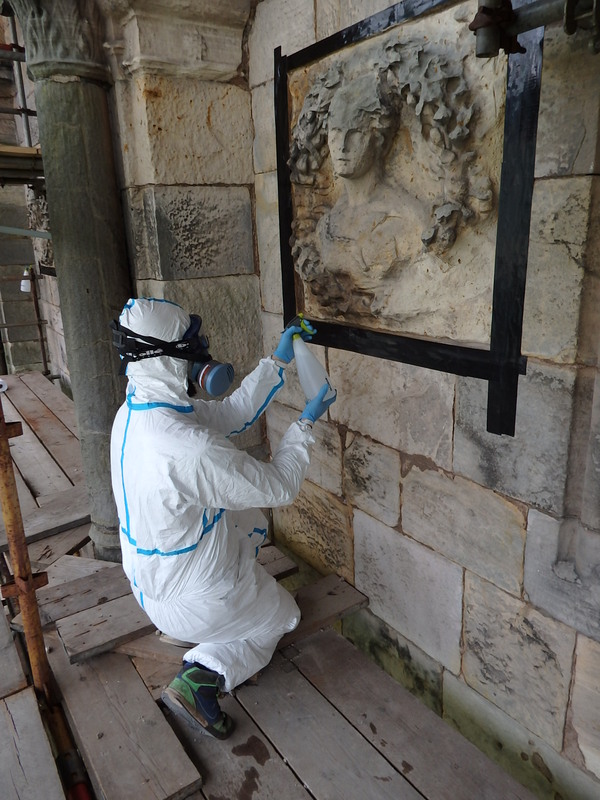 If you visit Falkland Palace over the coming weeks, you will probably see the conservators on site working on the final stage of conservation. The finished work will be unveiled in November. This process will help to ensure that the roundels are preserved for future generations. 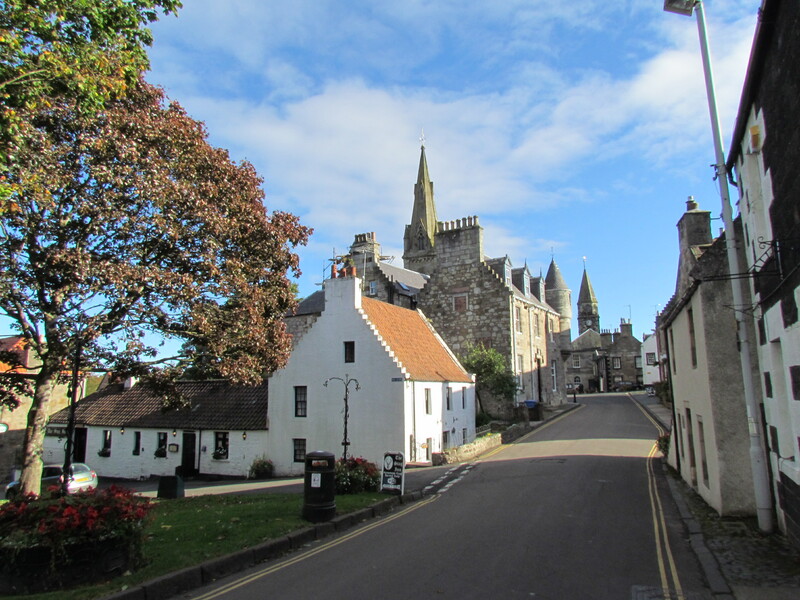 This entry was posted in 2015 Year of Conservation, Falkland Palace and tagged conservation project, falkland palace, falkland palace and gardens, National Trust for Scotland, Year of Conservation on April 30, 2015 by falklandpalacegarden. 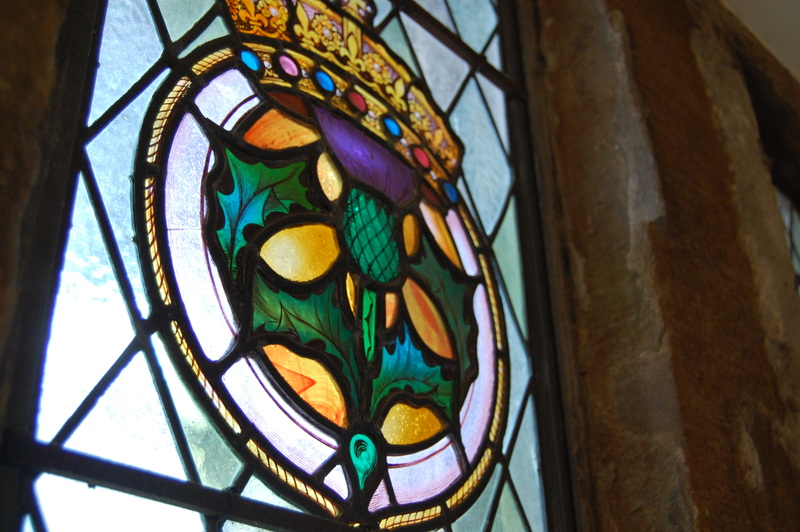 All of our stained glass windows at Falkland are heraldic and late 19th century. 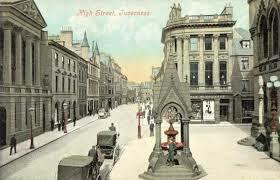 They were commissioned by John Patrick Crichton- Stuart, the Third Marquess of Bute. The Chapel and Tapestry Gallery windows were commissioned in 1893 and installed in 1894, with the windows in the office and private apartments (currently hidden behind our scaffolding) installed a little later in 1897. 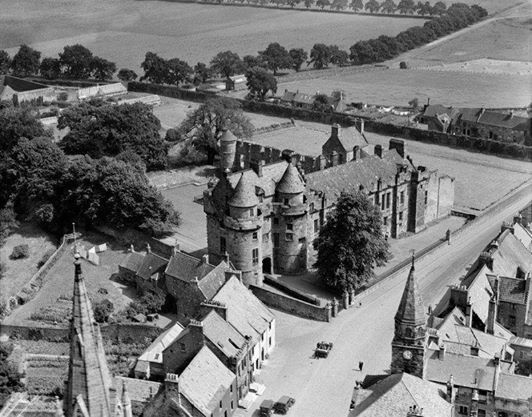 Bute also renovated the rest of the palace (look out for the carved window shutters and door in the Keeper’s Dressing room of his children and a portrait of himself) and completely rebuilt the Cross-House. 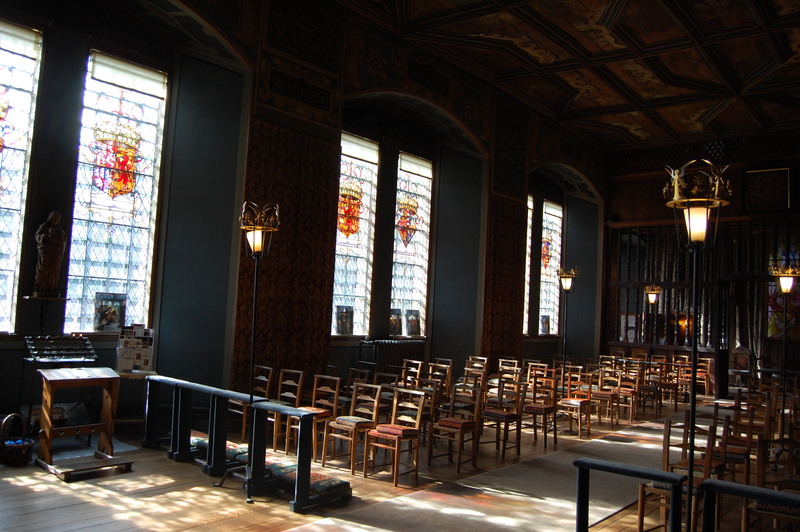 Most of the windows in the Chapel and Tapestry Gallery are in pairs of husband and wife; James IV appear alongside Margaret Tudor, James V appears next to his second wife Mary of Lorraine and so on. However, poor Magdalene of France (James V’s first wife) is all by herself in the Ante-Chapel, and the Dauphin of France, Francis II (Mary Queen of Scots first husband) is isolated in the Vestry. Equally, look out for some very lonely people in the windows of the stairwell just beyond the Tapestry Gallery. Lord Bute has included the arms of David, Duke of Rothesay (who mysteriously died at the Falkland in 1402, possibly at the hands of his uncle, Robert Stuart) and the lovely Isabel Countess of Fife, who died childless and passed the 13th century Castle (the ruins of which can be seen in the gardens today) to her brother-in-law, also Robert Stuart. The Chapel. The stained glass look glorious on a sunny day and creates the most beautiful patterns on the chapel floor. 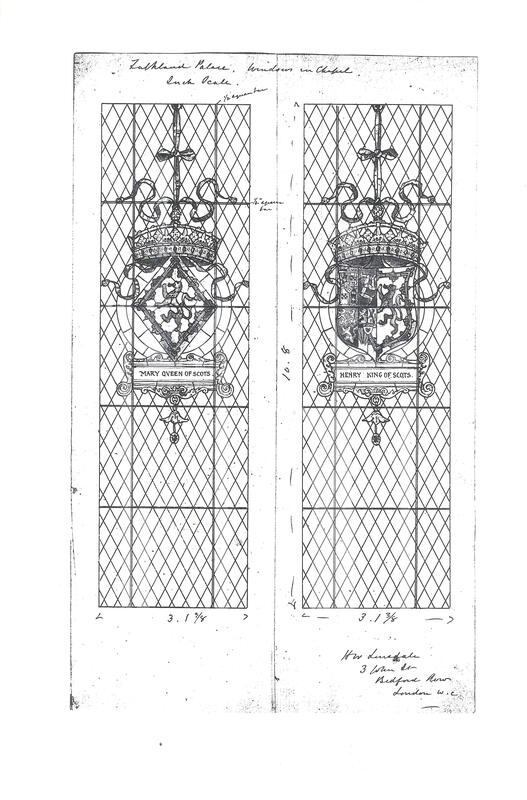 Sketch by H.W Lonsdale for window of Mary Queen of Scots and Henry Stuart, Lord Darnley. 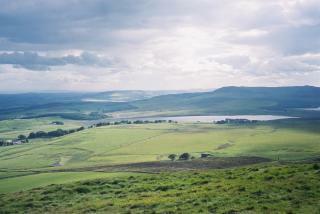 Image courtesy of National Trust for Scotland Archive. The cartoons and sketches for the windows were drawn up by Horatio Walter Lonsdale, however, the idea behind their design came from Lord Bute. The windows copy a manuscript known as the Lindsay Armorial, published in 1542. It is a register of all the heraldic arms and shields of the aristocratic families in Scotland, as well as members of the Royal family. 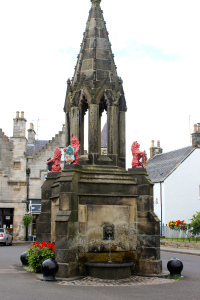 Sir David Lindsay was also the court poet for James IV and James V, and would have stayed at Falkland when the Royal Court was based at the palace, so the choice of his armorial is especially fitting. 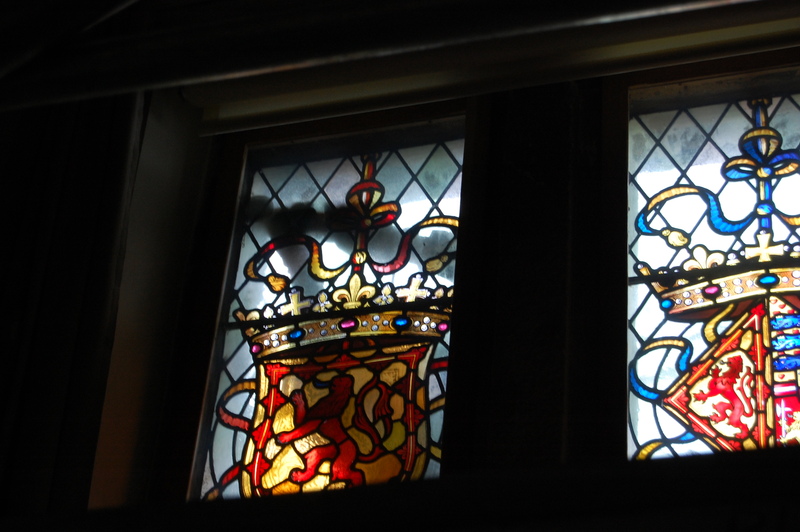 Equally, Lord Bute was very keen to make sure the windows were historically accurate. When you visit the chapel, look at the wall directly opposite the windows and you will notice that Bute has copied some of the 17th century wall paintings (look just above the tapestries), which depict windows with diamond-shaped glass. The plain glass in the windows in the Chapel and Tapestry is all diamond-shaped to copy these wall paintings. 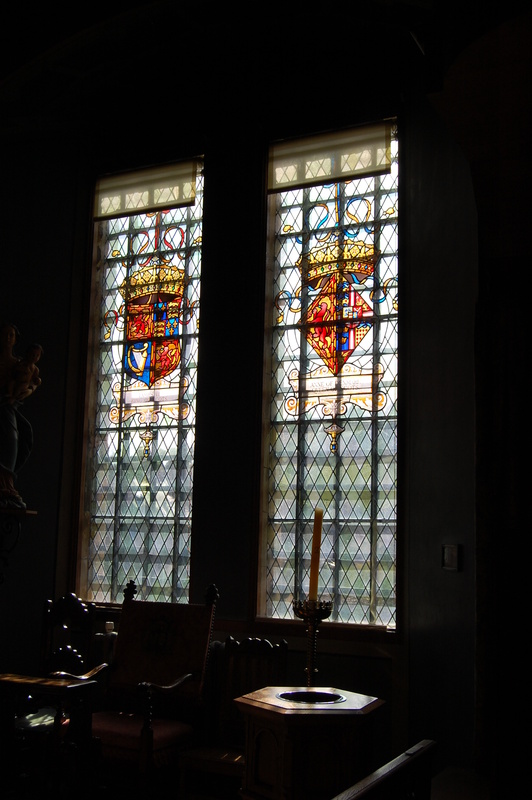 At Bute’s other homes, such as Castell Coch or Cardiff Castle in Wales, the plain glass behind the figures or shields is far more complex, often with patterned geometric shapes. 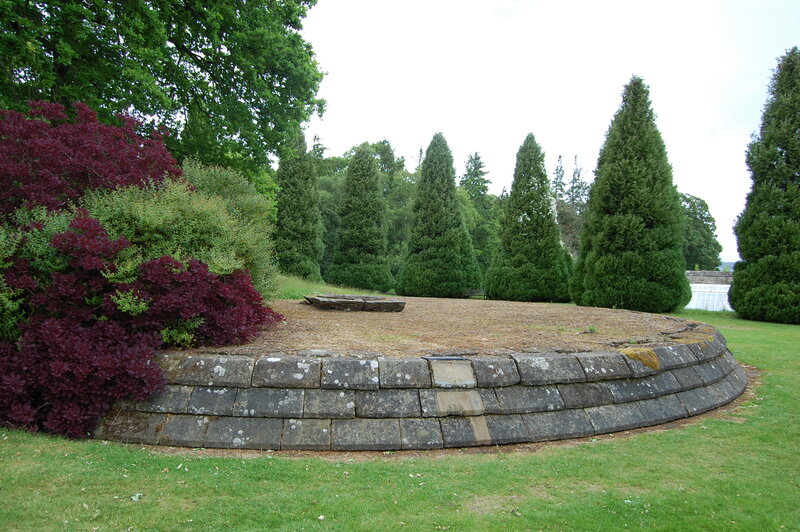 Hence, at Falkland it looks as if Lord Bute has chosen to follow the diamond-shapes (known as quarry glass) for a particular reason. The cement which holds the windows in place being very carefully removed, ready to lift the window free! Royal badge of James V in the office (currently hidden behind all our scaffolding). You can just about make out that the window is bulging inwards and has caused some of the glass to fracture. between the window panes stretching and putting stress on the glass, causing fractures. However, this happens naturally and gradually over time. A few windows had these cracks within the glass panes and will be mended with a glass resin (you will hardly notice it when re-installed! ), which works like a very strong glue to hold the broken glass together. 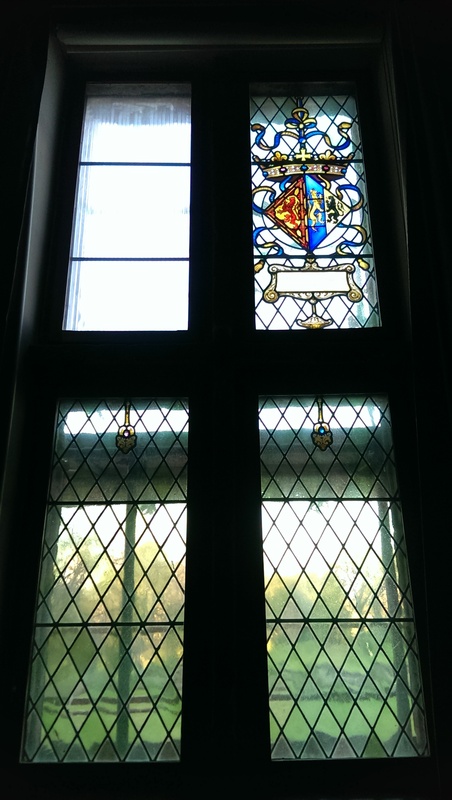 The windows in the chapel need minor resin repairs, which will be performed with the windows still in place. If you are lucky you might get to see some conservation in action on one of your visits to the palace! All of the windows will also be cleaned as, like your windows at home, they end to get a bit grubby over time. The Palace hidden behind scaffolding. 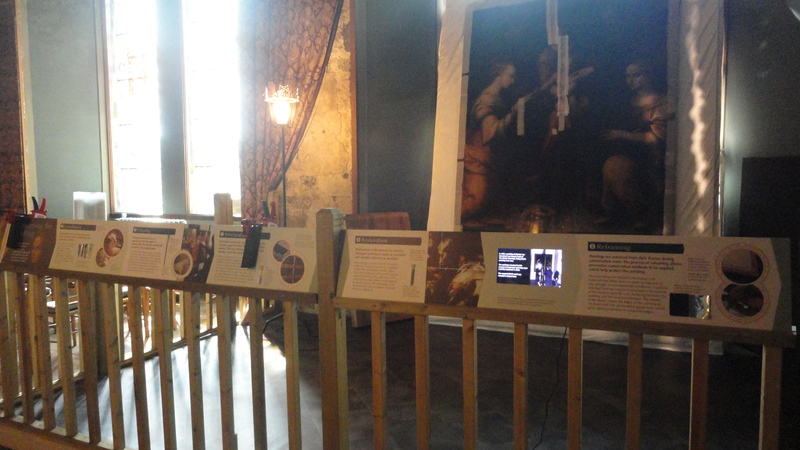 We now have some information boards and signs up telling you about the conservation to make it a bit more interesting. 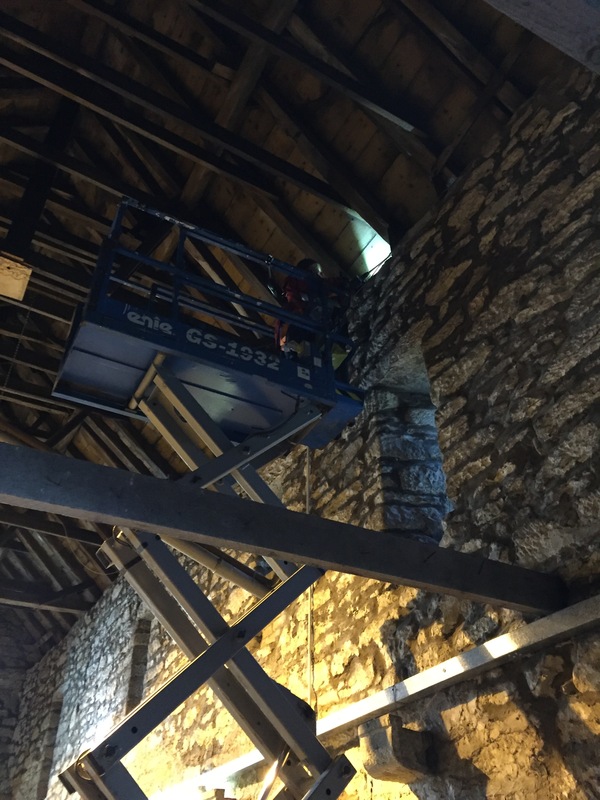 As scaffolding was needed to access the glass, the we decided to have a full Year of Conservation (the stained glass will not be re-installed until November) and work on the historic stone roundels on the exterior of the palace at the same time. Inside, the painted ceilings will also be restored. 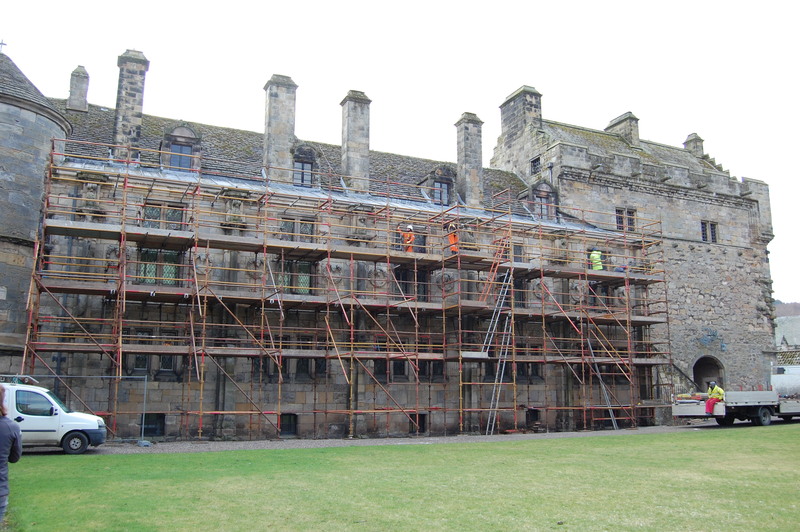 The Royal Commission for Ancient and Historic Monuments of Scotland is also going to carry out a survey of the palace over the summer, as the scaffolding means easier access to those usually hard to reach places. We will be posting more information as the year progresses, letting you know what happens and talking to the conservators. Equally, keep an eye out for conservation talks and family workshops. 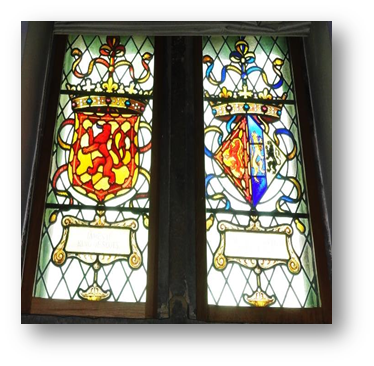 This entry was posted in 2015 Year of Conservation, Falkland Palace, Stained Glass and tagged conservation project, falkland palace, falkland palace and gardens, National Trust for Scotland, Year of Conservation on April 16, 2015 by falklandpalacegarden. Work around the palace never ends, especially for our resident gardeners who are always kept busy none more so than in the Orchard. 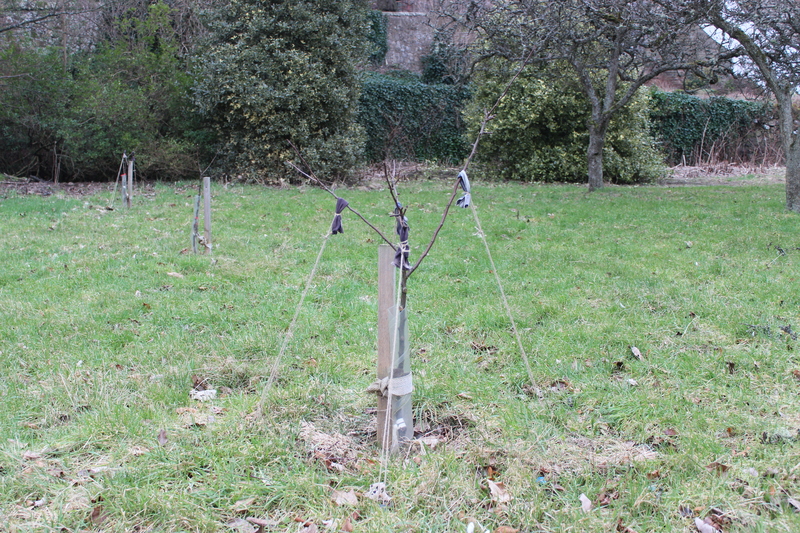 Our apple trees require a lot of maintenance throughout the year to keep them nice and in order. It’s necessary to ‘train’ the trees by applying ropes to the branches so that they grow to our gardener’s desires. The fruit that we harvest from our orchard is used in our annual Autumn fruit pressing events. 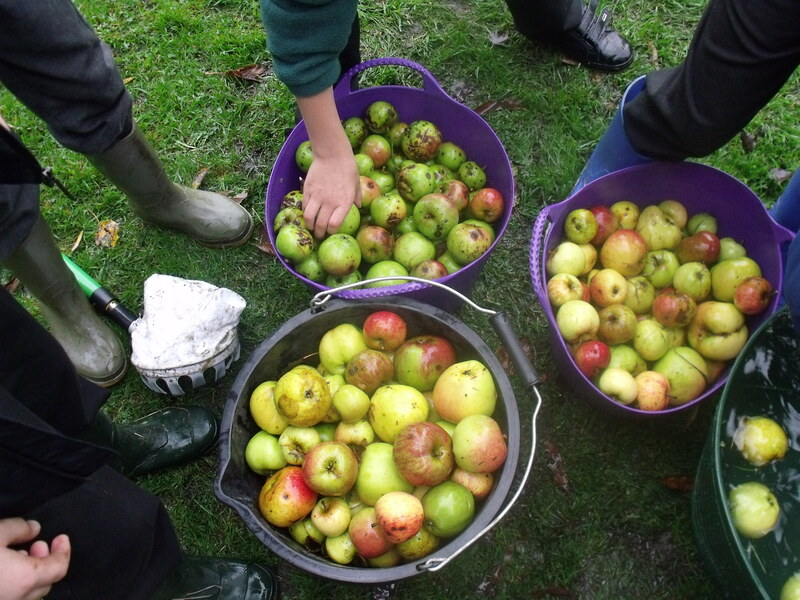 We work to produce our own apple juice and invite local school children along to learn about this exciting process. It’s delightful work with a tasty and fresh drink at the end. All of this hard work goes towards maintaining our Orchard in its beautiful state to be enjoyed by our visitors every year especially during the Summer time when our flowers come in to full bloom. 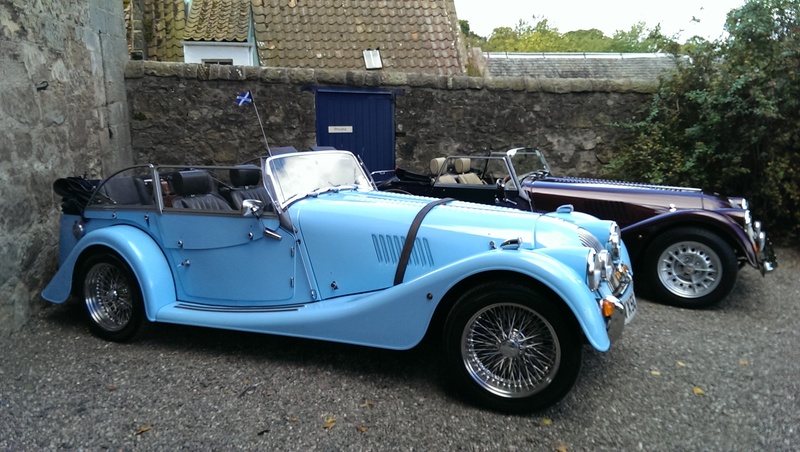 This entry was posted in Gardens on February 16, 2015 by falklandpalacegarden. Our Year of Conservation is well under way. First up are our beautiful stained glass windows. The process of removing the panels began this week. 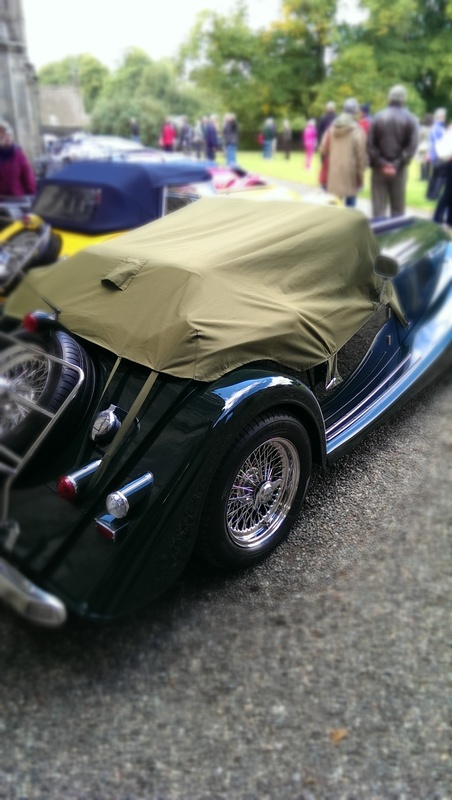 It’s a delicate job with these precious works of art and every care is taken to ensure they are kept unscathed. 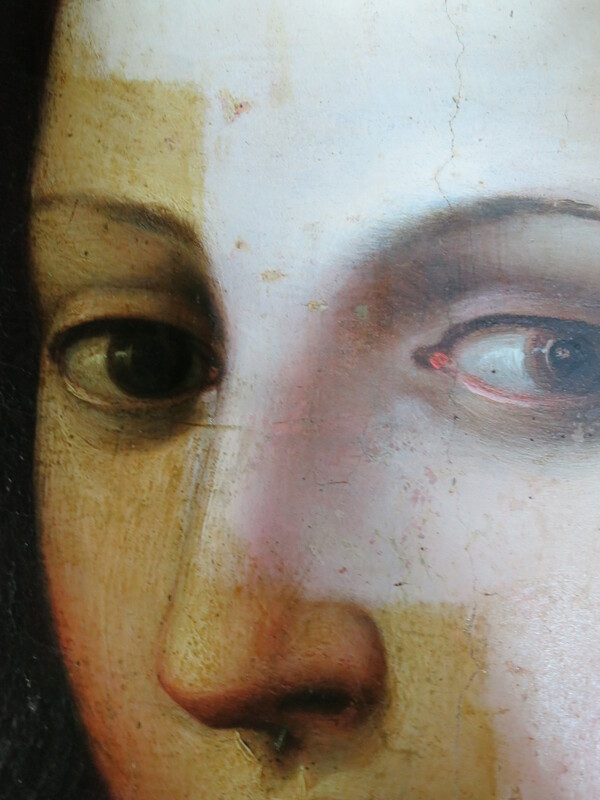 They are due to be cleaned up and restored before being returned back to us even more stunning than before. We are looking forward to seeing them sparkling new! The panels before removal looking in need of a good clean! 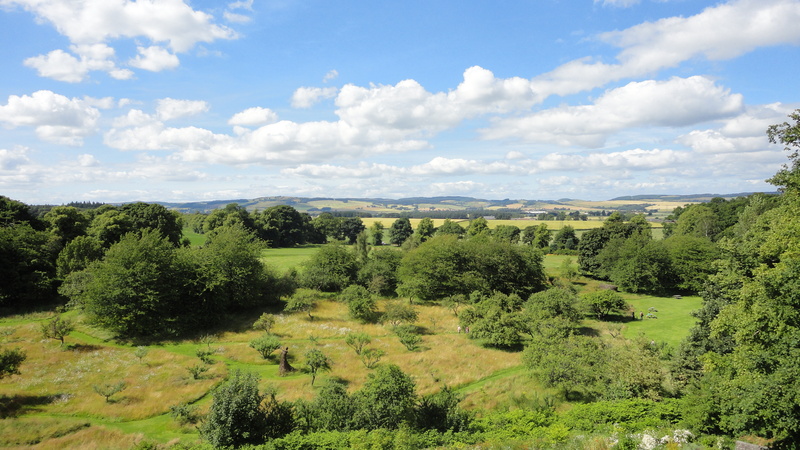 This entry was posted in 2015 Year of Conservation and tagged falkland palace and gardens, National Trust for Scotland, Year of Conservation on February 10, 2015 by falklandpalacegarden. 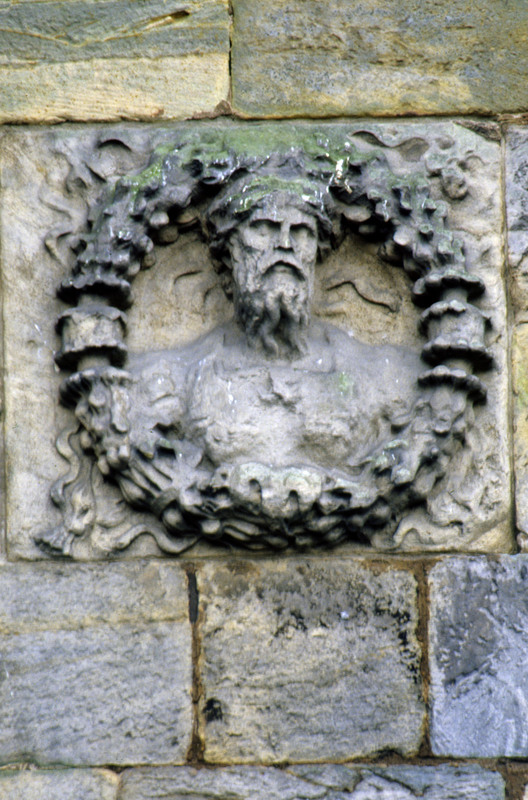 2015 will be a year of conservation at Falkland Palace and Gardens with lots of exciting projects with conservation work taking place on some of our stunning stained glass windows, painted ceilings and stone roundels (similar to the Stirling Heads). You can keep up to do date with all the happenings here as we chat to the conservators, give you lots of photo updates as well as information on talks and family workshops. 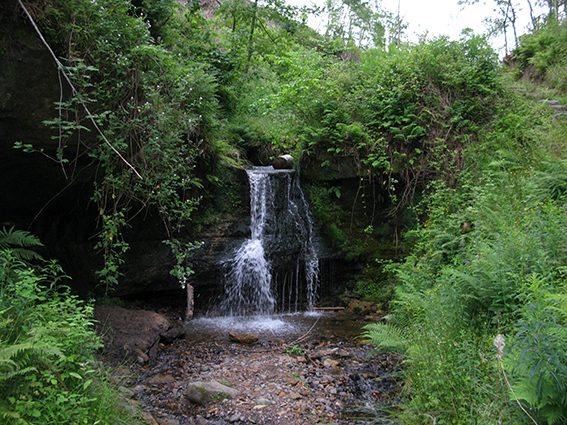 This entry was posted in 2015 Year of Conservation and tagged National Trust for Scotland, Year of Conservation on February 10, 2015 by falklandpalacegarden. 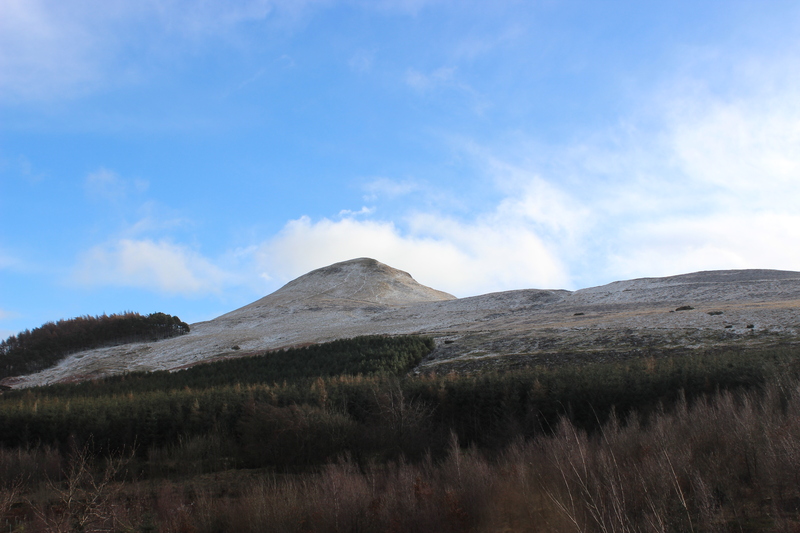 2015 will be a year of conservation at Falkland Palace and Gardens with lots of exciting projects coming up over the course of the year. 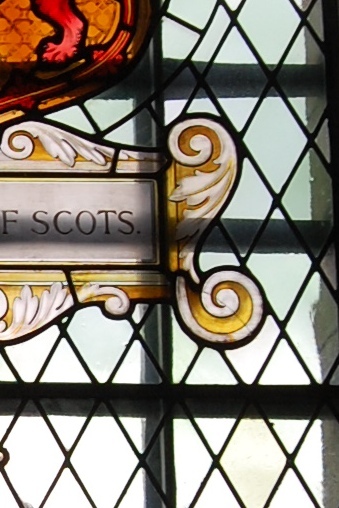 Conservation will be taking place on some of our stunning stained glass windows, painted ceilings and stone roundels (similar to the Stirling Heads). You can keep up to date with all the happenings here as we chat to the conservators, give you lots of photo updates as well as more information on talks and family workshops. 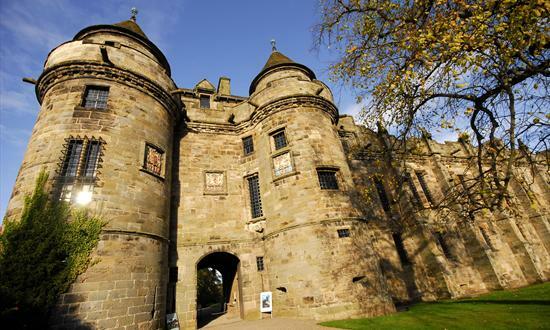 This entry was posted in 2015 Year of Conservation and tagged falkland palace and gardens, National Trust for Scotland, Year of Conservation on February 8, 2015 by falklandpalacegarden. 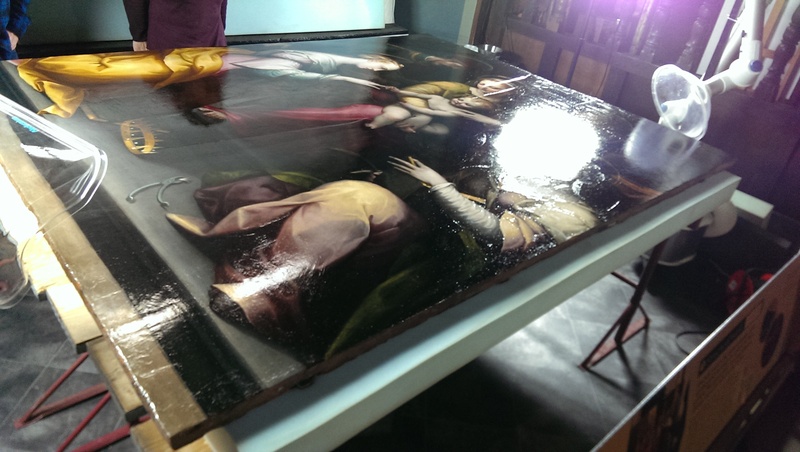 The team are nearing the end of the painting conservation project after months of pain staking work. Recently Gail and Henry have been filling in cracks in the wooden panel with plaster and painting over the plaster to bring the painting back to it’s former, unified glory. After a coat of varnish they will assess the paint work as the varnish makes the details easier to see. The varnish layer is then left to dry for a few days and in a weeks time the painting will finally be ready to be wrapped up once more and moved into the Tapestry Gallery to climatize before re-hanging. This entry was posted in Painting Conservation and tagged painting conservation project on November 4, 2014 by falklandpalacegarden. 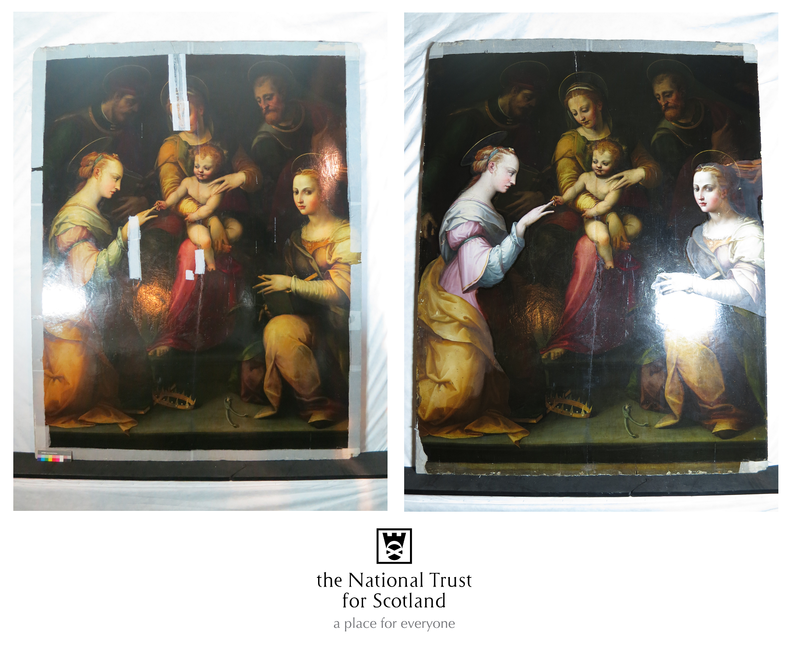 The project is now in it’s 6th week and the team are entering the next phase of conservation. The painting was recently turned on it’s face and Gail and Henry have been working on the woodworm damage on the back of the painting, which they have now completed. The painting is now face up and visitors can see up close the cracks that have occurred in the wooden panel over the last 500 years. 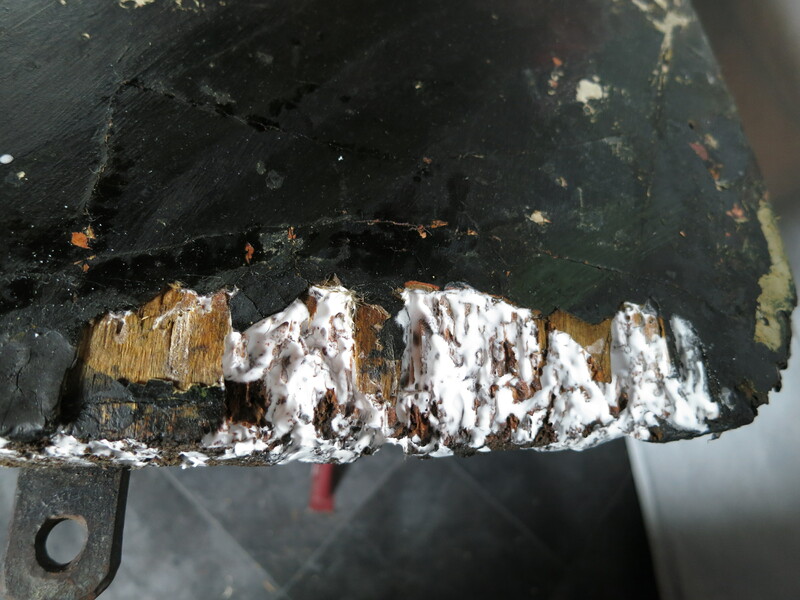 Gail and Henry are filling these cracks with a special plaster just below the surface of the painting so as not to lose any of the original paintwork. 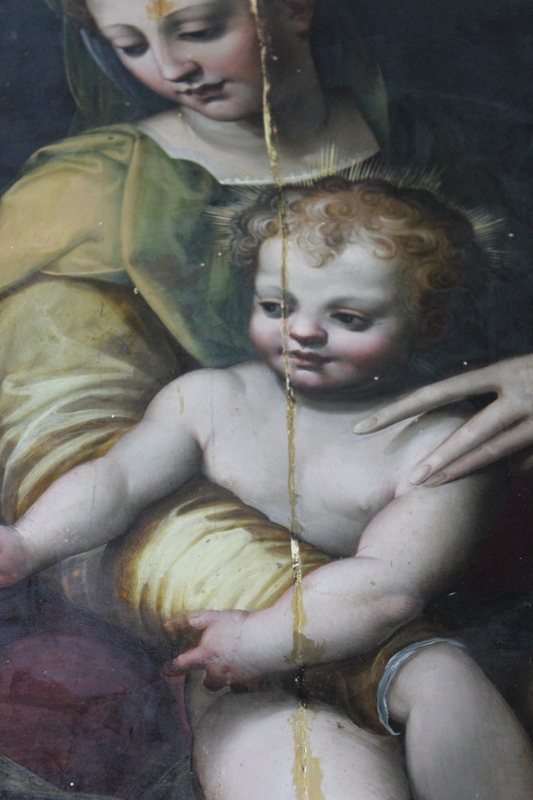 Some of the edges of the painting have also been filled with the plaster as the woodworm damage has been particularly savage along the grain here. Now that the painting is cleaned and one solid, smooth surface a hint of how magnificent this painting will look once the project is completed is starting to show. The next stage will be to sit the painting upright against it’s special designed supports and to work on the re-touching of the plaster work. 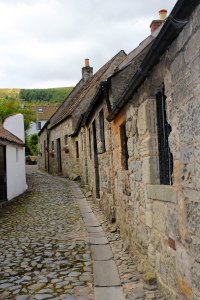 This entry was posted in Painting Conservation and tagged falkland palace and gardens, painting conservation on August 29, 2014 by falklandpalacegarden. Work has begun on the back of The Mystic Marriage this week after it was was carefully moved by professional art handlers T&S yesterday. 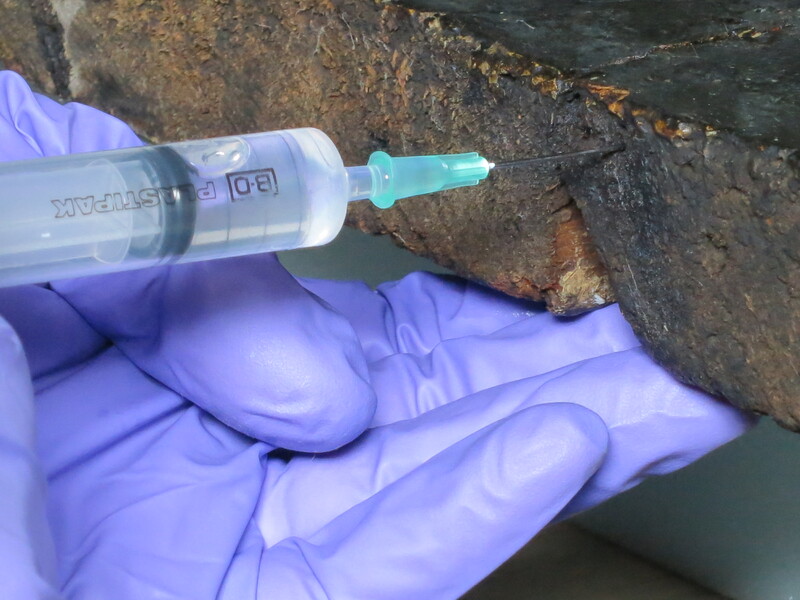 The thick wooden panel has a woodworm problem which conservators Henry and Gail are now addressing by injecting synthetic resin and micro balloons into the holes they have left. This will not only kill off the pests but also add structural strength to the panel. Henry and Gail said “We are very pleased with the progress we have made so far and the overwhelming interest visitors have in the project. We are enjoying engaging with the public and explaining what we are doing”. 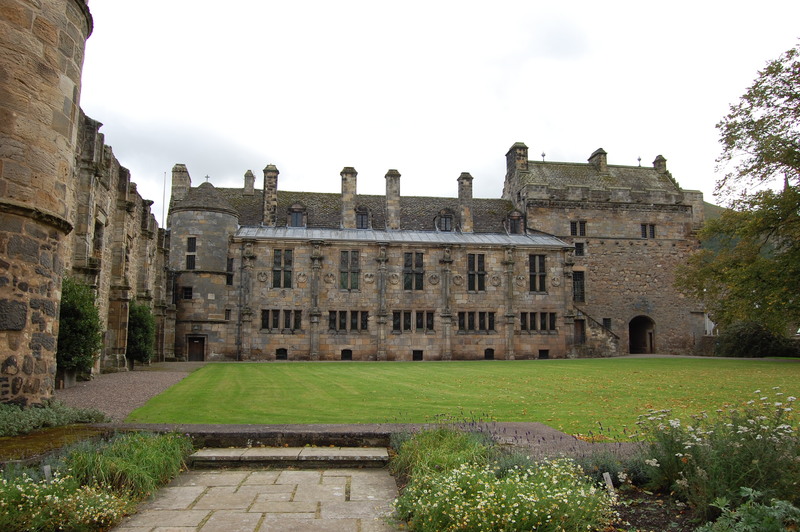 This entry was posted in Painting Conservation and tagged falkland palace and gardens, painting conservation project on August 19, 2014 by falklandpalacegarden. 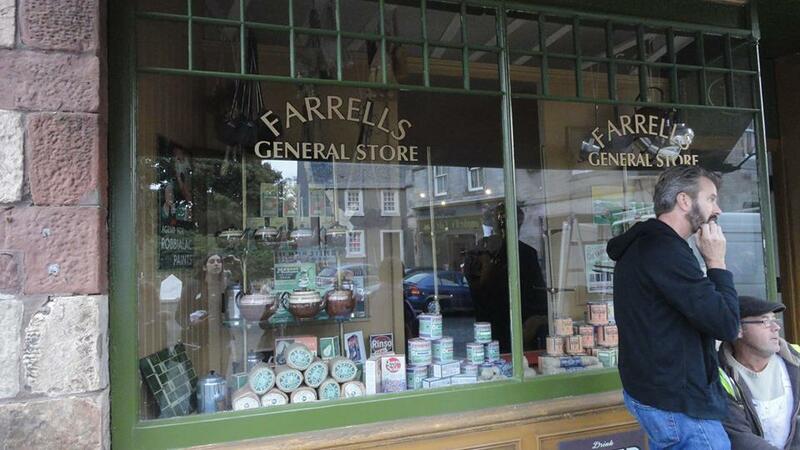 Work began on removing 500 years of varnish, retouching paint and dirt today by Henry and Gail. Visitors and staff were astounded by the obvious difference in colour and tones that can already be seen. We had a pleasant surprise when we realised that the cream sleeve of St Catherine was in fact a beautiful baby pink! The parts of the painting that have already been cleaned are starting to look as fresh as the day they were painted, incredible! 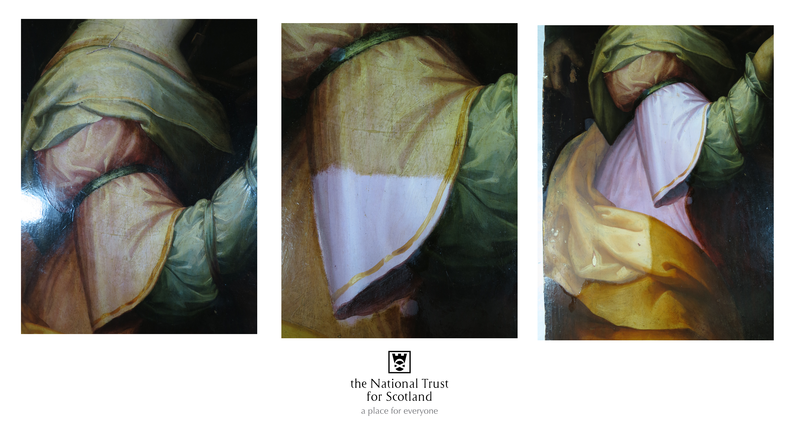 This entry was posted in Painting Conservation and tagged falkland palace, painting conservation project on July 29, 2014 by falklandpalacegarden. Spotted in the Chapel Royal: The Mystic Marriage has emerged from its packaging! 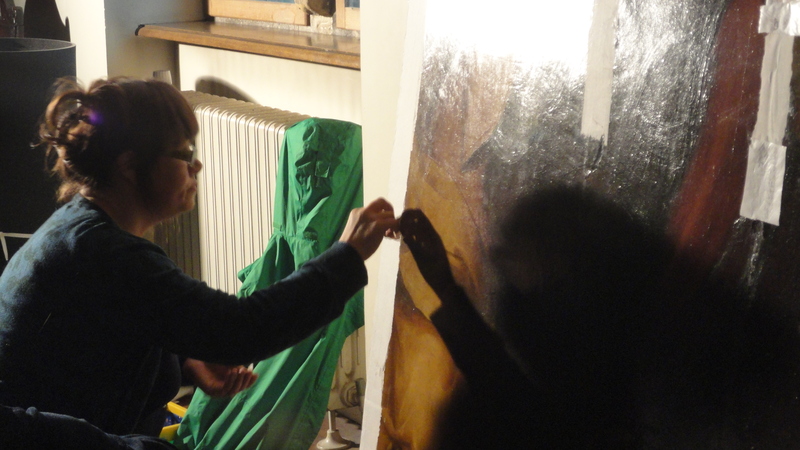 With the painting unwrapped and the studio space installed, the much-anticipated conservation work can finally begin. As of next Monday, Henry and Gail will be hard at work in the Chapel Royal. Come on over if you’re interested in seeing conservation in action! 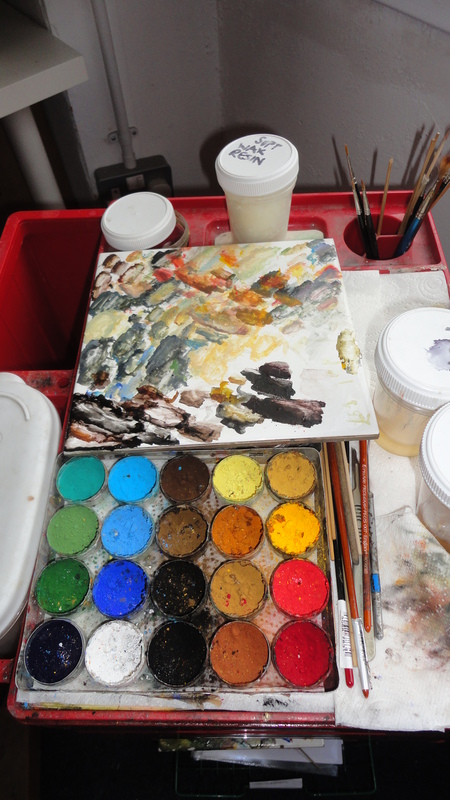 Until then, you can check out the lovely interpretation set up around the studio space, which will let you know a bit more about the painting and the ongoing process. The studio space awaits Henry and Gail’s arrival. 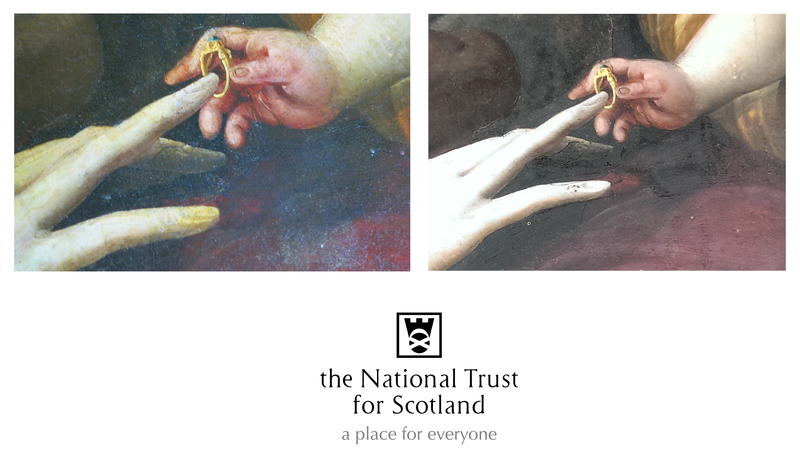 This entry was posted in Painting Conservation and tagged falkland palace, painting conservation project on July 27, 2014 by falklandpalacegarden. 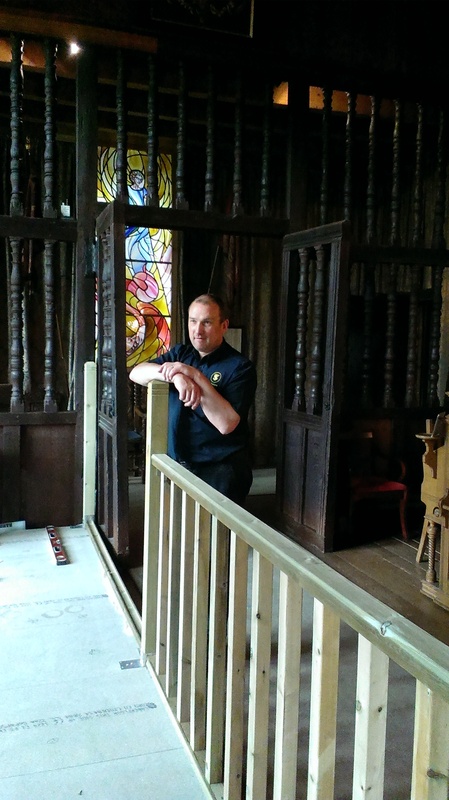 Thanks to Alistair and Mark’s hard work, the platform is now complete and The Mystic Marriage has been moved to its temporary home in the Chapel Royal. Thus far the painting is proving to be a rather reclusive resident, as it is still under wraps and will remain so until it has acclimatised to its new surroundings. Best keep an eye out, however, for the painting will be revealed sometime within the next few weeks—we hope you are as excited as we are! In the meantime, take a wee peek at the shiny new space as pictured below, and be sure to drop by the Chapel Royal throughout the process to watch it all happen in person. 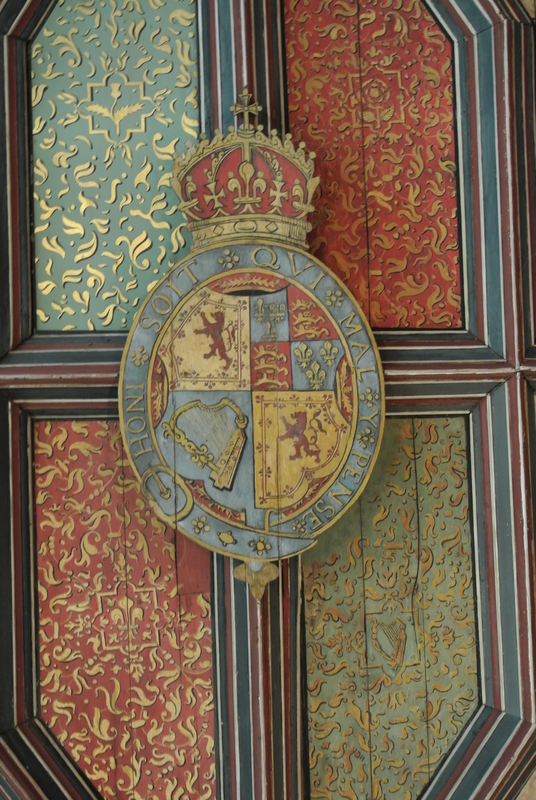 This entry was posted in Painting Conservation and tagged falkland palace, painting conservation project on July 9, 2014 by falklandpalacegarden. This space will ensure that the painting will have enough room while allowing the public to see what is going on. Thankfully the local congregation are 100% behind the project and don’t mind losing a 20 chairs for a few months! 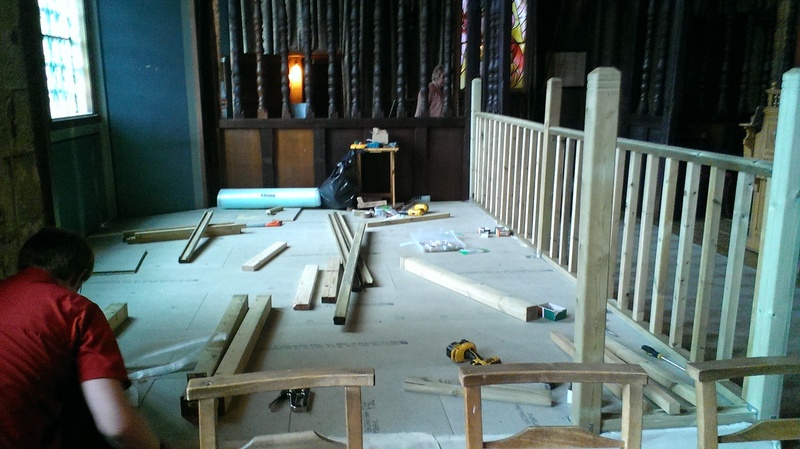 The staff have been wondering what the boys will do with all that wood once the project is completed, decking anyone? 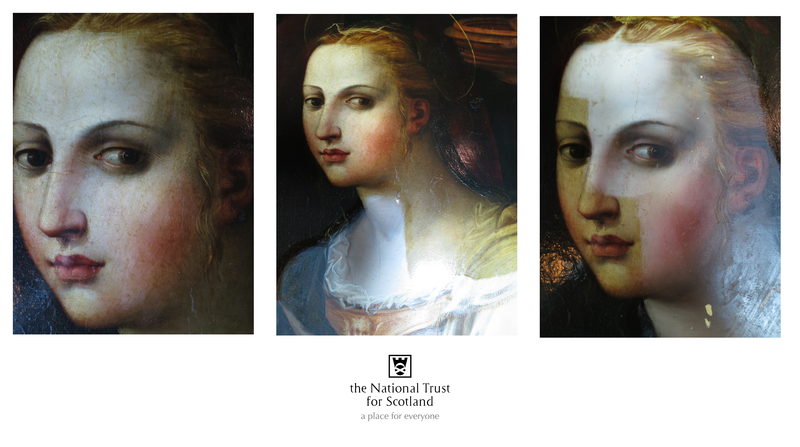 This entry was posted in Painting Conservation and tagged falkland palace, painting conservation project on June 30, 2014 by falklandpalacegarden. 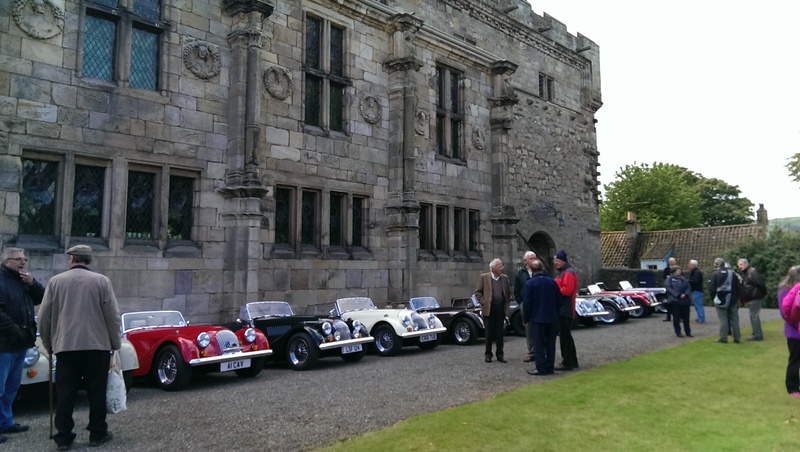 After the doors of Falkland Palace were closed the project team flew into action! 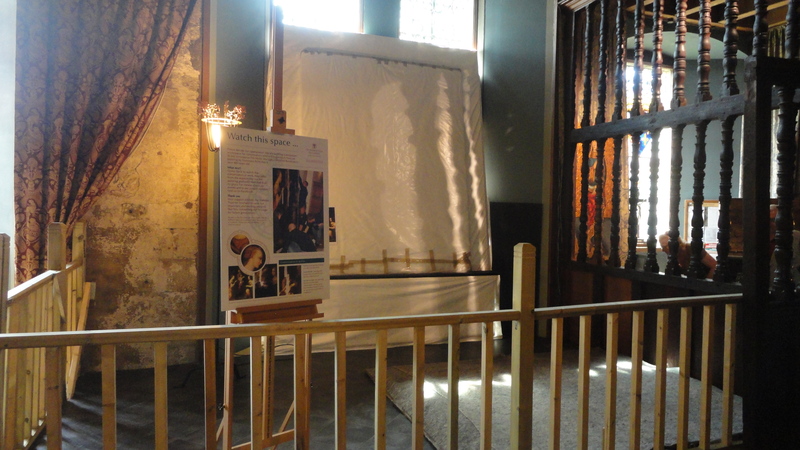 A back board was made for the painting to help support it and make it easier to move into the Chapel Royal from the Tapestry Gallery. 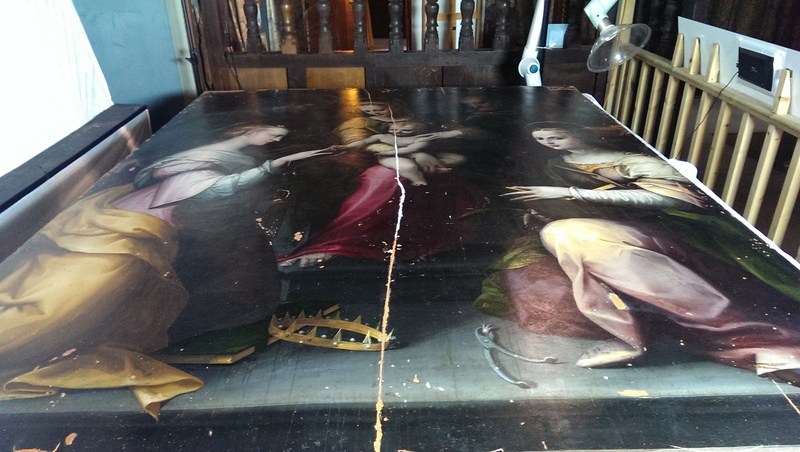 The painting is very large (over 2x2m) on solid wood, with old metal brackets on the back the painting was also extremely heavy and required the help of the T&S team. 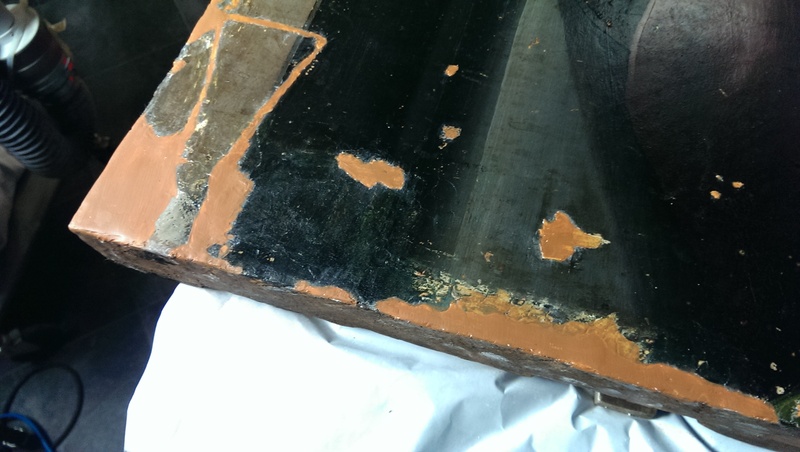 The protective conservation covering was taken off to allow Henry and Gail to take paint samples. This will give them a better idea of what the paint contains chemically and how best to treat it. 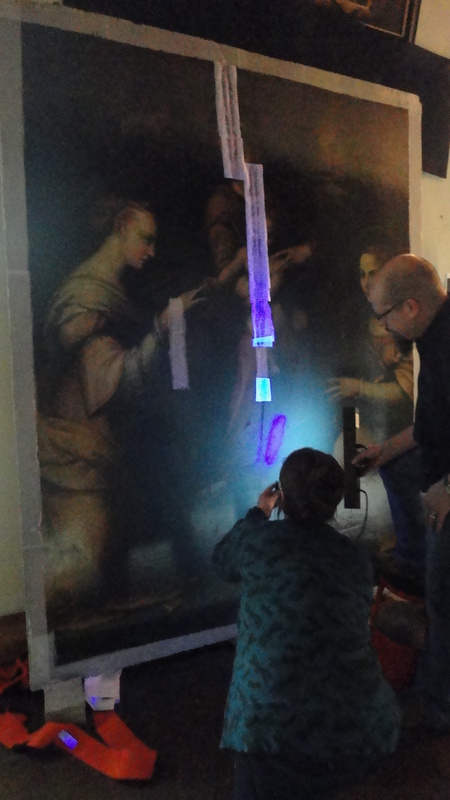 They also had a look at the painting with a UV light. 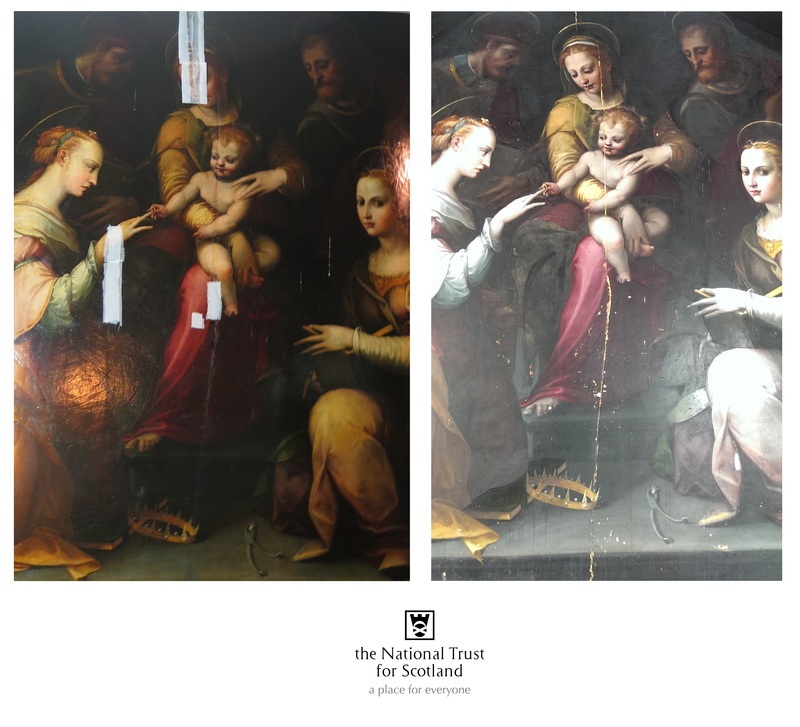 This enabled them to see the different layers of paint and retouching over the last 400 years, fascinating! In the end it took the team 6 hours to make the board, unwarp the painting, attach the painting to the board, take paint samples, do a UV check and wrap up the painting again, phew! 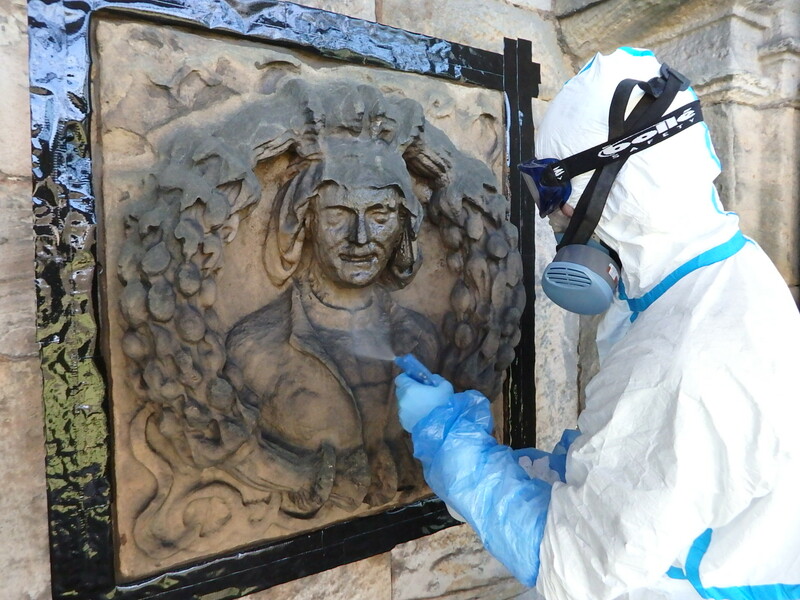 This entry was posted in Painting Conservation and tagged falkland palace, painting conservation project on May 29, 2014 by falklandpalacegarden. I bet you are wondering, who are these crazy people who will be taking on this huge conservation project! Henry and Gail- the conservationists who will be working on the painting, from Egan, Matthews and Rose in Dundee. We are all very excited to be working on this project and putting our different skills and expertise to make the most of this exciting and unusual project. 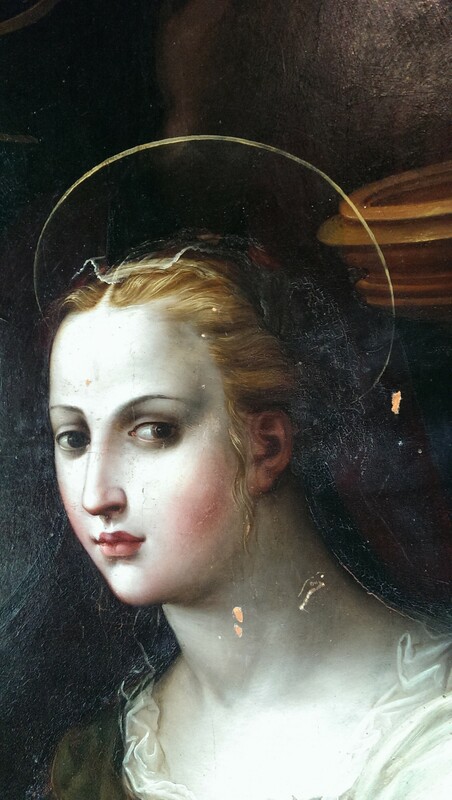 This entry was posted in Painting Conservation and tagged falkland palace, painting conservation project on May 21, 2014 by falklandpalacegarden. Today we have moved the The Mystic Marriage off the wall where it has been hung for a number of years. Conservationists Henry and Gail had a good look at the painting to see what work will need to be done. 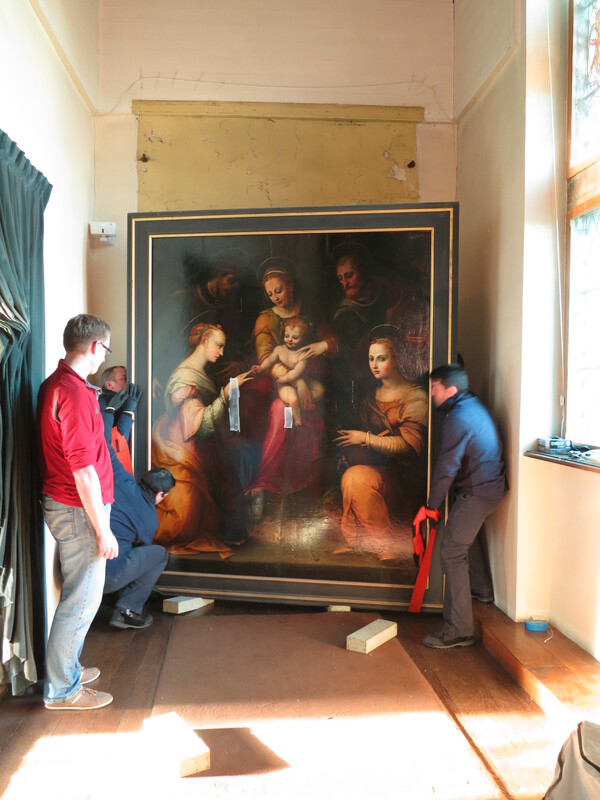 Like most painting conservation projects this one was planned to take place in the conservation studio, but the painting is too big to get out the Palace! So we have decided to do the work on site, how exciting! This is a very rare occurrence and certainly no one in the team ever remembers happening at all in the National Trust for Scotland. 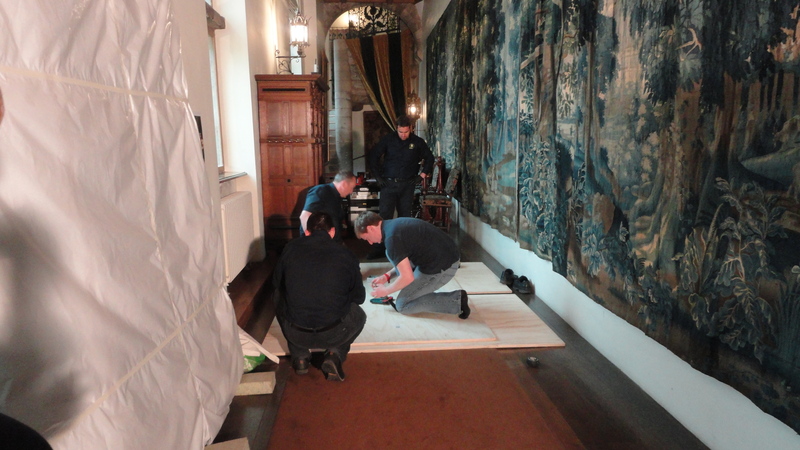 The painting is now wrapped in conservation grade wrapping and left it to acclimatise in the Tapestry Gallery. 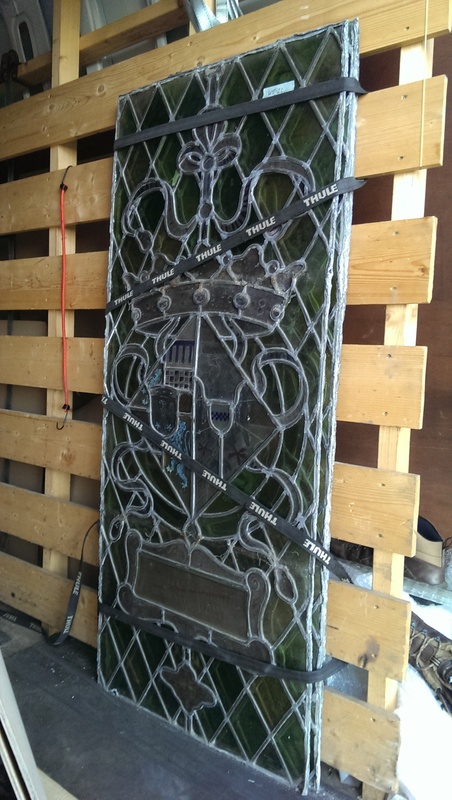 It will eventually be moved into the Chapel Royal onto a custom made platform to begin conservation work. 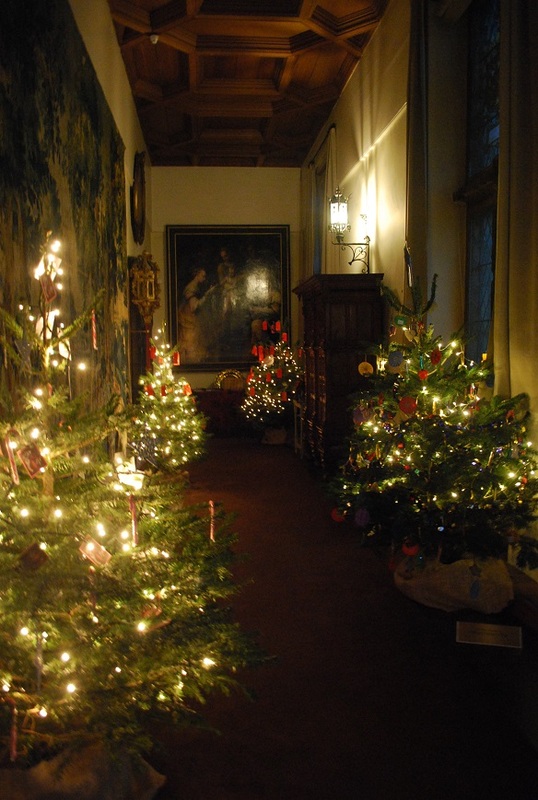 This entry was posted in Painting Conservation and tagged falkland palace, painting conservation project on December 1, 2013 by falklandpalacegarden.